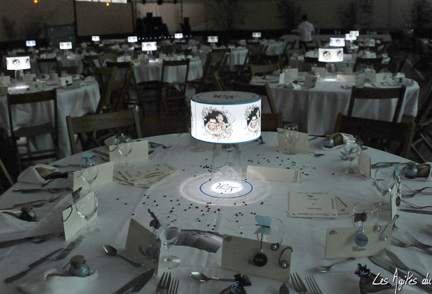 Our lit centerpieces were recently featured at a June wedding in rural France. We designed the centerpiece to coordinate with the brown and teal colors of the wedding decor, and sent over all the shade parts and mats to be assembled in France. The base chosen was an IKEA vase, available in their France stores, and our shades fit perfectly! 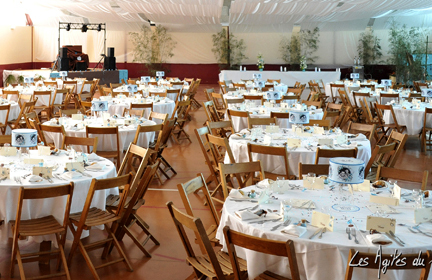 The local event planner did a marvelous job of transforming an ugly basketball stadium into a romantic setting for an elegant wedding celebration. 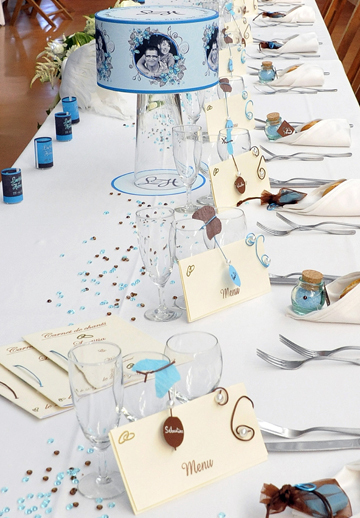 Place cards and menus were lovely accents along the table. Accent details were whimsical compliments to the centerpieces, and the overall effect was charming. We were so happy to have been a part of this romantic event, even if sadly we were far away! Our decorative centerpieces and shades are designed with one thing in mind: You! Using light weight materials, we elegantly display your personal message, and illuminate it. We Illuminate You! Illuminaria 2012. Simple theme. Powered by Blogger.